GU Comics is a single panel webcomic written, drawn, and colored by Woody Hearn. Established July 10, 2000 and launched August 15, 2000, GU is published, free, five times a week on its own web site. The comic focusss primarily on popular video games; but, it also comments on gaming industry and community news, often lampoons gamers in general through the adventures of Woody and his fictional roommate, Ted, and occasionally parodies contemporary social, political, and personal issues related to the online and general video game world. Driven as it is by the ever changing videogame industry, continuity of the story line is not important, though it does have a few recurring themes. GU Comics was first released to a small group of friends on July 10th, 2000. Then known as "/gu ...", the original comics were set inside the MMOG fantasy world of Everquest, centered around the in-game antics of the artist and members of his guild (Purifying Light on Vallon Zek), and borrowed heavily from Scott Kurtz's "Ding" for layout and single panel delivery. Intended only as a hobby, the comic's link was passed around to various Everquest related community sites (Evercrest.Com being chief among them). On July 25 2000, GU was contacted by the GameFan/Game Answer Network with an offer of affiliation and a proposal to go "live". Now hosted on the GameFan/Game Answer Network, GU was released for wide public consumption August 15th, 2000. The response was swift and significant. Since its inception GU has been forced to change hosts for various reasons. 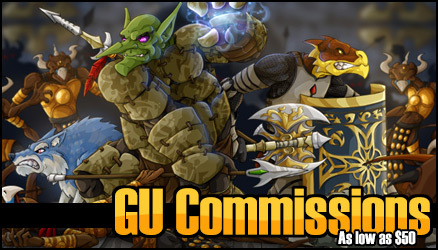 February 4, 2003, GU moved to hosting by the Safehouse and in August of 2008, at the request of the Safehouse, took over control of the GU server . On February 5th, 2003, signifying the move to the Safehouse and a shift in interest to the wider gaming world rather than focussing specifically on Everquest, the slash and ellipses were officially dropped from the GU logo. On April 9th, 2007 the format of the comic was shifted from 300x465 to 600x450. Along with the format shift the logo, and comic type sub- text was removed from the strip. Beginning March 17th, 2008 panels were still hand drawn, but were being inked digitally. As of April 3rd, 2008 GU Comics has moved to full digital production eliminating the paper waste associated with sketching and inking the comics on card stock. In July of 2010, Stormhaven -a member of the GU Forum Community and popular contributor of guest strips- was asked to begin collaborating on the comics as GU's primary writer. GU is sketched, inked and colored digitally in Adobe Photoshop using a Wacom Cintiq 21UX. The initial file setup is 2400x1600 pixels at 300 dpi. The comic is then resized to internet resolution (72 dpi), where backgrounds, text, lighting and copyright info are added. Once the comic is published, a writeup, citing relevant news sources when needed, is associated with the comic and linked from the front page and archives. The direction of the art in the comic has changed constantly throughout GU's history. Earlier strips were intentionally simplified and used a 2-color gradient as the background. The current work is a mix of complex detail, colored in a hard edge anime style, offset by a cartoon-like exaggeration of proportion and anatomy. The characters and text are set upon highly distorted backgrounds relevant to the theme of the comic, and use soft, but intense, light sources that serve as a counterpoint to the hard-edged coloring style. Text bubbles and font choices have remained relatively unchanged since GU's inception. GU primarily uses fonts licensed from Blambot.